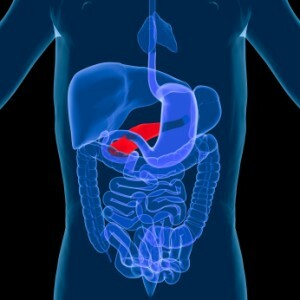 What are the Main Causes of Pancreatitis? Alcohol: Alcohol triggers the release of pancreatic enzymes sooner than normal and can cause small stones to form within the ducts, blocking the passage of enzymes out of the pancrease into the small intestine. This can affect the breakdown of protein, fat and carbohydrates leading to diarrhea. *Talk to your doctor about taking pancreatic enzymes if diarrhea is chronic and a bacterial infection is a concern. Vicadon and antibiotics should not be used long term. Protease: breaks down protein and keeps the intestine free of bacteria, yeast and parasites. Amylase: Breaks down carbohydrates. A deficiency can lead to diarrhea. Malabsorption of nutrients can occur from poor digestion of food (due to reduced pancreatic enzyme activity), which will result in nutrients passing into the stools. This is seen especially with fat and fat soluble vitamins (A, D, E) as digestion of fat is highly dependent on pancreatic enzymes. In some cases, diabetes can develop if the pancreas is not able to make enough insulin to help control blood sugars, so blood sugars stay high. The best diet for pancreatitis requires protein, fat and carbohydrates in moderate amounts to prevent diarrhea. You want to eat foods in fermented or sprouted forms when possible so that enzymes are present in the food, are pre-digested and easy on your pancreas. Keep water on hand and drink throughout the day. Vegetables: Studies have found the best diet for pancreatitis includes a vegetable rich diet that keeps pancreatitis away. Aim for 3 servings per day. Soaked and sprouted only. All of these contain enzyme inhibitors and can cause the pancreas to swell and inflame. Best to avoid unless they are prepared correctly. Real sourdough or sprouted bread only. MCT Oil: MCT Oil from coconut oil does not require pancreatic enzymes for digestion. This should be your go to fat for adding to meals and shakes. Avocado and olive oil can also be used in small amounts.